Did you know that our Cherrymore cherry juice is made from 100% fresh cherries that we grow ourselves on our farm in Young, NSW? Over four generations, the Batinich Family have been growing cherries in Young, and we are now very proud to be producing a beautiful fresh cherry juice. We do not use any juice concentrate, or add any preservatives, water or colouring. It is just pure crushed cherries from our farm. After the cherries are crushed the juice is pasteurised and bottled giving it and extended shelf life. Once the bottles are opened the juice should be refrigerated and consumed within about 10 days. I have suffered from leg cramps at night. I take tablets etc to help ease the cramps. This week I had some of your cherry juice and have had no cramps !!!! Hopefully this will continue. By the way – in my high school days , my family lived at Koorawatha. All the more reason to buy Young cherry juice. Can you comment on how pasteurisation affects the antioxidant properties of the cherries? The antioxidant levels shown are actually tested after the juice has been bottled. I hope that answers your question. Is your cherries juice organic ? are they black cherries ? Our juice is 100% pure juice from local-grown cherries and does not contain any concentrate or other additives. We have many regular customers that have received relief and they re-order our juice on a regular basis to relieve their Gout symptoms. How much does a bottle sell for? The price is showing on our website. Hi John – thanks for your question. Our best results are seen when 250ml is consumed daily. This can be drunk straight from our small bottle (easy!!) or a few days supply from our 1L bottle (slightly cheaper). The antioxidant levels are high and we get fabulous reports of our Cherrymore juice’s anti-inflammatory benefits. I’ll give you a tip – your body certainly lets you know when you miss a day!! It’s a true health tonic. Take the 20 day challenge and let me know how you go…………. 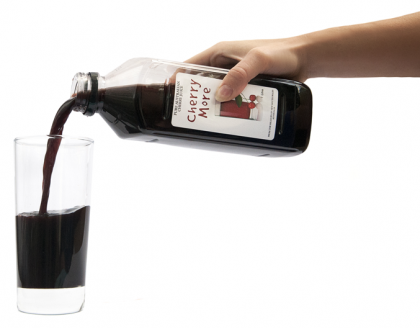 The results show that cherry juice concentrate has over 17 times more antioxidants than red grapes. I don’t comment on blogs much, but your blog is so convincing that I couldn’t stop myself from commenting. You’re really doing a great job. Congratulations and thanks for sharing such lovely tips with us. Cherrymore is our cherry and plum orchard located in the beautiful Hilltops Region just South from Young, New South Wales. The Batinich Family have been owned and run the Cherrymore Orchard for the last 4 generations. All Cherrymore products of “Single Origin”, all the fruit used in our products come from our own orchard. Young is one of the best growing regions for stone fruit in Australia and is home to the National Cherry Festival every year.